The first full week in February is known as Burn Awareness Week. In honor of that, we're sharing the story of Minneapolis Fire Captain Kathrynne Baumtrog, who survived being burned and now helps others through their ordeals. MINNEAPOLIS — Thousands of people suffer from major burns every year. Leading experts say many burns are completely preventable. Since the first full week in February is known as Burn Awareness Week, we wanted to share some stories from local survivors in Minnesota. We start with a local hero who risks her life every day in the hopes to help others. She also happens to be a burn survivor. The scars are now part of Captain Baumtrog's story after she suffered 3rd degree burns on more than 25 percent of her body. In 2012, Baumtrog was one many firefighters trying to save the historic Walker Community United Methodist Church after lightning struck the century old building. She and five colleagues were leaving the church attic when they became caught in a flashover, a life-threatening event no firefighter wants to face. Thankfully, no one died in the fire that day, but Baumtrog and her colleagues suffered serious burns. 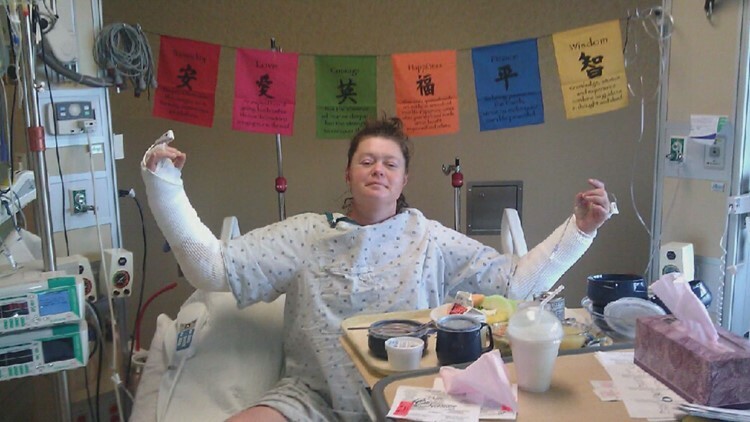 She spent more than 20 days in the hospital, going through multiple surgeries and hours of rehab. Minneapolis Fire Captain Kathrynne Baumtrog in the hospital after suffering 3rd degree burns on more than 25 percent of her body. Today, she is back doing the job she loves while advocating for fire safety and offering support to the burn community. Captain Baumtrog also is a volunteer with Firefighters For Healing. She's a counselor at Camp Red, which is a burn camp for young kids.